TSX-V listed Woulfe Mining announced Tuesday its Sangdong tungsten-molybdenum project, believed to be one of the largest of its kind in the world, is getting even bigger. Woulfe says that its second phase of drilling and further historical data compilation at the previously mined project in South Korea enabled it to increase indicated resources by a factor of 2.75 which would support the initial 10 years of mining. Production at the 100%-owned property is scheduled to commence in the first half of 2012. The mine would produce about 4,000 tonnes of tungsten worth $180 million per year. The company also owns the Muguk gold-silver mine, formerly South Korea's largest gold mine. VANCOUVER, BRITISH COLUMBIA–(Marketwire – Jan. 24, 2012) – Woulfe Mining Corp. ("Woulfe" or the "Company") (TSX VENTURE:WOF)(OTCQX:WFEMF)(FRANKFURT:OZ4) is pleased to announce the following completion of the phase 2 drilling and further historical data compilation at the Sangdong mine in South Korea, Tetra Tech Wardrop (Tetra Tech) have completed an update of the Mineral Resources. The Resource for the skarn mineralised zones is summarised in Table 1. It is important to note that this Resource represents mineralisation only within the Upper Section of the mine. The Resource given in Table 1 represents approximately one-quarter of the known dip length, broadly that above the historical -2 level, of known mineralisation from the old mine. An updated estimate for the mineralisation down dip will be forthcoming in the near future. Woulfe are continuing to drill and explore within the accessible working areas to refine the Resource. Table 1. Resource estimate for Sangdong, skarn mineralised zones, Upper Section. This Resource update (effective date January 5th, 2012) represents the combination of the new compliant phase 2 drilling results and further compilation of detailed historical geological and mining data. Work concentrated on developing more detailed models of the three skarn zones from both drill data and additional historical geological mapping. Importantly, additional Intermediate alteration mineralisation was defined between the two thinner skarn zones, the F2 and F3 zones, that go to make up the footwall zone. Additional mining records were digitised and detailed models of historical mining depletion were created. Each of the skarn zones is described below. In each figure blocks in green are of Indicated category, blue of Inferred category. Blocks shown in red are not classified for reasons described by zone. Figure 1: Illustrative perspective view of the model of the Sangdong Hangingwall Zone with historical workings. Figure 1 shows that the Hangingwall Zone above -2 level is unclassified in this update. This is a change from the interim resource update of July 2011. Geotechnical studies showed poor ground conditions in this upper area where this zone is close to the surface. In addition the phase 2 drilling encountered consistent problems in attempting to core this zone with little addition to the sample inventory. This reduction in confidence in this zone at this level in the mine led to non-classification. Tetra Tech note, however, that there is still good potential for this zone down dip, which will be reported in the near future. The detailed study of historical mining areas largely concentrated on the Main Zone. Areas of mining depletion were modelled and Figure 2 shows the effects of historical mining. The Main Zone is largely mined below the -2 level as shown by the blocks in red. A zone of Indicated mineralisation is defined on the Eastern periphery of the Main Zone. The down dip Resource potential is thought to be limited to pillars remaining in the lowest levels of the old mine. The footwall zones were the main subject of the detailed study of historical geological mapping and distribution of the mineralisation. This resulted in a change of approach from that in the Interim Resource report. This estimate has divided the Footwall Zone into two separate skarn zones, the F2 and F3 zones, plus a zone of lower grade alteration material between these zones termed the Intermediate Zone. It is anticipated that in some areas it will be possible to mine the three units together and this will be determined in the current Feasibility Study work. Figure 3 shows the distribution of Indicated and Inferred blocks in the F2 Zone. The current modelling is consistent with historical down dip information for the Footwall Zone and the down dip potential of these zones is good and will be reported in the near future. Figure 2: Illustrative perspective view of the model of the Sangdong Main Zone with historical workings. Figure 3: Illustrative perspective view of the model of the Sangdong F2 Zone with historical workings. Woulfe are continuing to drill, explore and sample within the Upper Section of the old mine and plan to dewater down to -4 level in the near future to allow these efforts to be expanded. Definition and refinement of the Sangdong models will continue as more underground drilling is completed. This data will increase the sample density increasing the area meeting the criteria for the 'Indicated' category. This news release has been reviewed and approved in the form and context in which it appears by Mr Paul Gribble FIMMM, C.Eng, of Tetra Tech who are working with Woulfe on the Sangdong studies. Mr. Gribble has appropriate qualifications and sufficient relevant experience to qualify as a Qualified Person for the reporting of mineral resources and exploration results for the Sangdong deposit. 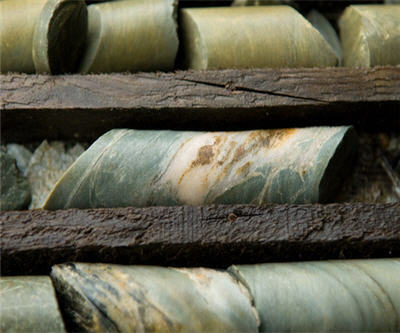 Brian Wesson, President and CEO of Woulfe Mining, commented, "The drilling programs have been successful and produced a significant upgraded in the indicated resource. The proving up of over 10 years of mining resources to accommodate the mining of 1.2 million per annum from above the valley floor (above 2 level) takes the project forward a large step as it provides sufficient ore for the feasibility. The feasibility study is running three months late due to the drilling and the metallurgical test work which was moved to China. Tungsten was mined and APT manufactured for many years by the previous mine owner Korea Tungsten. Woulfe is focused on reconfirming the recoveries and looking to optimise the flow sheet using new age Chinese technology that has been developed over the last 20 years as the world's largest APT supplier. Feasibility is due for release at the end of the quarter."